MariaDB database engine, created by former MySQL creator Monty Widenius. Called for Monty’s daughter name, Maria ("My" in "MySQL" is for My, Monty’s son), this modern, effective and relatively sleek database solution is a perfect successor of MySQL product line. Today, a couple of MariaDB stable versions are existed, leading by most modern builds of a major version 10. The MariaDB crew dispatch efforts on the efficiency, speed and stability of newest releases, as well as provide new and new possibilities for data storage engines. The main difference between MariaDB and MySQL is a much bigger list of storage engine options provided by MariaDB. Other differences touch some aspects of data organization, advancing the effectiveness of MariaDB engine. As a result, Handy Backup provides a completely new data option for MariaDB backup and restoration, dedicated for taking most advantages from MariaDB internal and external technologies. 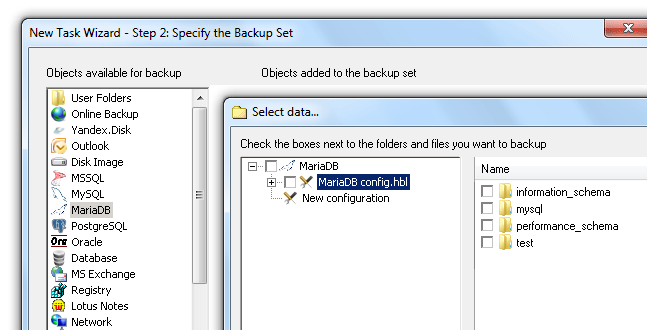 This option provides “hot” and “cold” backup of MariaDB databases, located on the server or remotely. MariaDB backup and restoration option, provided by Handy Backup, can effectively work with any version of MariaDB software, including the current (on a moment of creating this article) version 10.1.6. No extra efforts or fees are required for using MariaDB feature for different versions of this DBMS. To learn how to set up MariaDB data-saving and restoring tasks in the most effective way, please learn the different articles on this site about MariaDB backup and MySQL data-keeping techniques. Also, please try Handy Backup with MariaDB and MySQL features, downloading a free 30-day trial.